Guides are available for download at the base of this page. You must be a registered user to download documents – registration is fast and free. MRTFC (Multi-Residential Timber Framed Construction) is a certified fire and sound rated timber construction system conforming with the requirements of the Building Code of Australia (BCA) for multi-residential buildings. 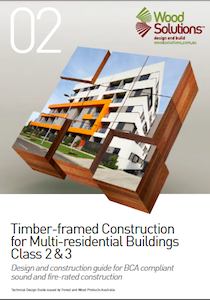 The Timber-framed Construction for Multi-residential Buildings Class 2 & 3 Design and Construction Guide provides designers, specifiers, builders, code officials and certifying authorities with information on MRTFC fire-resisting timber-framed construction that complies with the BCA. In addition, this guide provides assistance for those wanting to improve and upgrade sound performance beyond minimum BCA requirements, including low frequency impact sound, vibration induced sound and flanking noise. This guide does not deal with all aspects of fire safety and sound insulation. For further details on this issue refer to Appendix B - Deemed to Satisfy fire requirements Not covered by this Guide. Finally, this guide does not provide advice on which tested wall and floor systems should be used as there are many suppliers of these systems. The guide provides advice in many instances on how these tested systems are joined and interact while maintaining the objectives of the BCA.